Like many of the VTX models, Honda's 1300 S is a vintage-styled cruiser with the ability to transform its riders into road warriors. 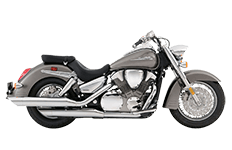 Mounting the wrong set of saddlebags can greatly affect the way this bike sits, performs and looks. We understand that riders want only the best, so we've created this lineup of Viking bags exclusively for the VTX 1300 S. Here you'll find detailed specs of every model, but rest assured, each one fits your motorcycle like a glove. Feel free to ask us any questions you may have about our products.